It was like one of those moments on Who Wants To Be a Millionaire when you can tell they know the answer to a big money question well before the four possible answers are revealed. Only this time, the prize was even better: a Cheap Trick baseball cap. This competition had my name written all over it. 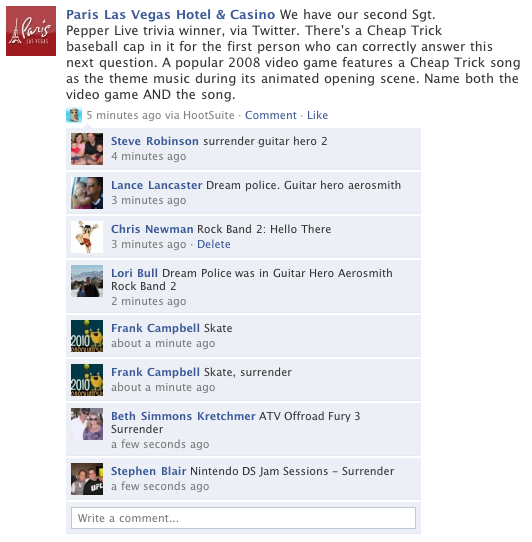 I just happened to notice an older Facebook post by Paris Las Vegas saying there’d be another competition any minute now to promote the new show by Cheap Trick at their hotel. I thought two possible things could happen: they’d ask the only possible Cheap Trick-related question that I would actually know the answer to, or it’d be a mad Google scramble while dozens of Facebook fans fall over themselves for the privilege of wearing some free advertising. I kept the page open, just in case. Actually I was later than third to answer, I saw a number of other wrong answers drop off the top (including, I’m sure I didn’t imagine it, one from FHBM’s Tim Dressen – dude I can’t believe I beat you on this) but I was quite amazed nobody else got it right. Perhaps Rock Band really is for eight year olds, and I really am having a mid-life crisis with this pretending-to-be-a-drummer phase. But whatever. It was one of those moments that was meant to be. This song makes up 50% of all the Cheap Trick songs I could name, and I haven’t played another video game (unless Lego Rock Band counts) in over two years. I think I was just due a win. Even with my limited knowledge of this band though, I’d actually quite like to see their show in Las Vegas. It’s doing a stint at Paris this summer and some of the dates collide with mine. It’s an odd concept: they’re playing through the entire Beatles’ Sgt. Pepper album. It’s not a Beatles tribute band, it’s Cheap Trick. But playing The Beatles. Followed by a bunch of hits I’m probably supposed to know. But after some deliberation, I’d already decided to decline Ticketmaster’s kind offer of securing two tickets for the price of three and take a risk that there’ll actually be some available at the hotel when I get into town in July. It’s a calculated gamble. There’s significantly less hype for this show than for Matt Goss playing twice a week to 200 people, and they can’t give those tickets away. But if it doesn’t happen, well meh. I can always listen to the real Beatles while wearing my Cheap Trick cap by the pool…. I know… I was so humiliated that I deleted my incorrect response. I’m a failure and a fraud.